Which size Dumpster rental is right For Your Project ? 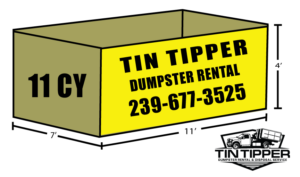 Tin Tipper : Dumpster Rental is an all-inclusive private waste disposal company offering 10, 15, and 20 yard dumpster rentals in Cape Coral. We service both residential and commercial customers in the Sanibel and Surrounding areas. Please feel free to call, email or use the text button to the right corner for any questions. You’re in good hands, let us know what you need. 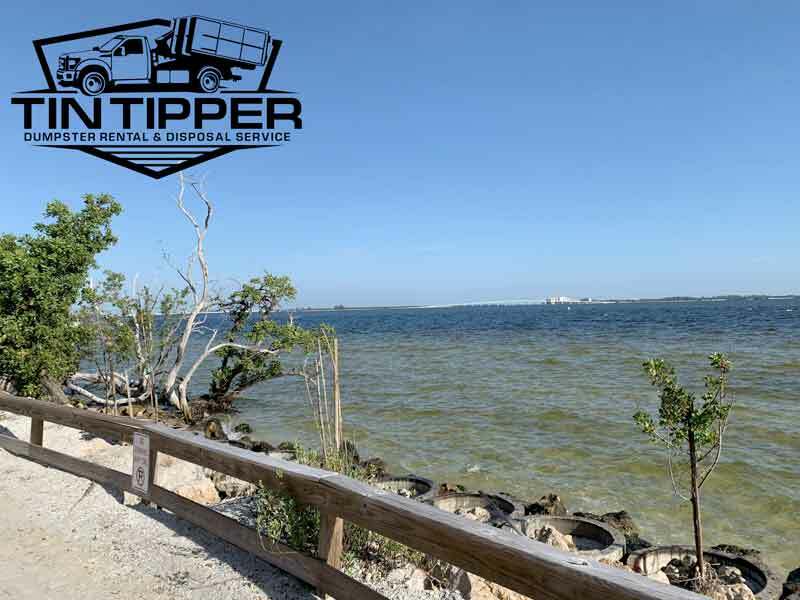 Why Choose Tin Tipper for Dumpster Rentals in Sanibel, FL? Easy Answer, we have what you need and we keep it simple. All of our services provide easy, hassle free, flexible options. We offer traditional dumpster rentals options, and if it’s time to get creative, we can handle it. 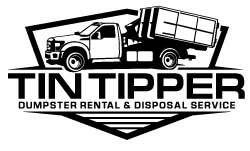 The Tin Tipper family is made up of men and women with a range of extensive backgrounds in design, home building, remodeling, demolition, trash removal, yard care, and more. Trust me, we have answers and we’re happy to help. Small (12 ft long x 7 ft wid x 4 ft high). Full, concrete, gravel or soil. This dumpster is capable of handling both light and heavy debris. Rental price includes delivery, pickup, and 2 tons (4,000 lbs) of disposal. Anything over 2 tons will be $50/ton. 10 days rental periods offered for the same price. $10/day for rentals over 10 days. Contractors and Commercial Customers: Please call for our flexible, no hassle rental period options. Medium (12ft long x 8ft wide x 4ft high). Half, concrete, gravel or soil. This dumpster is capable of handling both light and heavy debris. Large (12ft long x 8ft wide x 5.5ft high). No, concrete, gravel or soil. This dumpster does not handle heavy debris. Call, Text, email or submit a request form. Click Here for order form. Delivery of your dumpster, Don't worry you don't have to be home. Use the dumpster, get rid of that JUNK! Call us to pick up your dumpster. Yep, you once again don't have to be home! Enjoy your new space, and call us again next time for all of your dumpster rental needs in Sanibel! There are several reasons why someone may need to schedule a dumpster rental in Sanibel. We cater to a large amount of roofing contractors, business owners, general contractors, homeowners, etc. When you are making the choice for a dumpster rental size it is better to go to big than to small. We are happy to guide you to the right choice if you call us and let us know what we will be hauling and a ball park figure of the amount. We have been doing this long enough that we are experts in determining size based on the load and what we think the weight will add up to. When the dumpster is over the weight limit for the the size then extra fees are added in which can make it more pricey then just taking the next size roll off dumpster. For instance you may have debris with dirt mixed in and what most don't realize is that the dirt doesn't take up a lot of space but adds in extra weight which is why it is important to call us and get an expert opinion when making a dumpster rental. 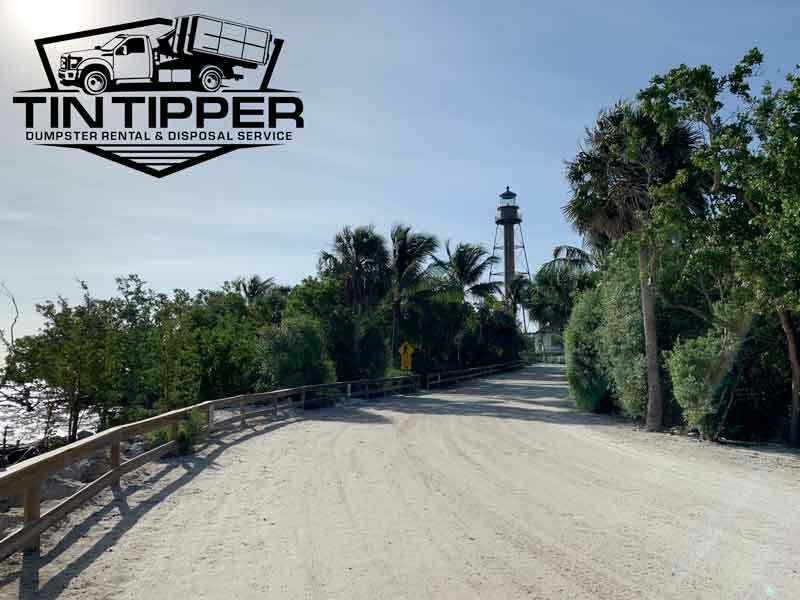 Renting dumpsters from TIN TIPPER gives back to our local Sanibel and surrounding community! We have partnered with 3 local organizations that have rendered undeniable benefits and help throughout our community. It is now time for us to give back to those who selflessly help others. 10% of every rental will be donated on our customers behalf to the organization of choice. Click here to read more. Call us today for you next Dumpster Rental needs on Sanibel Island, FL! Was able to go online and see pricing upfront and different size containers available. Pricing was better than all the ones I checked on, was delivered on time and when promised and picked up just as fast. I even ordered a 2nd one. Owners were courteous and answered all my questions and even had online chat available. Will definitely use again and highly recommend. Great company, very reasonable rates. I will use again if I ever need to rent a dumpster. Thanks for the great service! Super clean dumpster. Kevin the owner operator was truly a professional. He answered all my questions and concerns. The dumpster was delivered on time as promised. Pricing was cheaper than the rent a bag at Home Depot and less of a hassle. Pick up full dumpster was also on time. Thank you again it was a great experience. Rick from Cape Coral. We own a construction company and will always use Tin Tippers for our dumpsters! Reliable and honest are two words I will always use to describe them! Highly recommended. Great company, reasonable priced, fast and efficient. I would recommend this company for all your dumpster needs. A very good company here. Very good. These people understand ethics and they live by it. We called this company during our remodel, the owner was very helpful and professional. He definitely made this process easy! © 2017 TIN TIPPER : DUMPSTER RENTAL - CAPE CORAL, FORT MYERS, PINE ISLAND, SANIBEL, PUNTA GORDA, PORT CHARLOTTE, LEHIGH ACRES, ESTERO, CAPTIVA, AND OTHER SURROUNDING AREAS.